Our Position Sizing Tool is a powerful trading tool that allows investors to apply some very important money management rules. In this article we will discuss the concepts by a virtual trading setup so you can take full advantage of this position sizing instrument. Let’s say that we are interested in a long position in Apple Inc. First, we take a look at the daily chart to define our entry point. Let’s assume we want to buy the stock when price goes higher than the horizontal red line shown on the chart. So we put in a buy stop at $156.86. The initial stop-loss is set at $149.82 (once our buy stop is triggered). So now we have defined our entry price and an initial stop-loss. Despite the fact that the entry price and stop-loss level - based on our technical analysis - are critical parameters in a trading strategy it is definitely not enough to qualify the specific setup as a valid one. Unfortunately a lot of traders (and not only beginners) are convinced that their homework is done at this stage. There is however one very important component left which is an inherent part in the search for a profitable trading plan : money management or position sizing. Actually, it is the most important part in each and every trading strategy! And that’s where our Position Sizing Tool comes in. This powerful piece of software contains some state of the art moneymanagement filters that are calculated automatically. We only need to feed the calculator with some basic information regarding our setup position. Ticker: The ticker of the stock will be automatically filled in as soon as you click the chart of the stock you want to trade. In our example case this will be ‘AAPL’. Capital: In order to obtain reliable information we also need to fill in our total available trading capital. This is the total amount of our trading account. So next to ‘Capital‘ we specify the amount of our personal trading account, in this example $50.000. Entry Price: In the white box next to ‘Entry Price‘ we fill in the price that we are willing to pay for the shares. For this ‘AAPL’ setup our buy stop is set at $156.86. Exit Price: Next to ‘Exit price‘ we fill in the price level at which we will sell the shares to preserve our trading capital from greater losses. So this is actually the initial stop-loss price. In our example we will take our loss if price drops to $149.82. Note : filling in the entry and exit price in the position sizing tool is also possible by right clicking on the chart of the stock in which you want to take position in. Two options are available then : ‘entry price goes here’ or ‘exit price goes here’. Rounding: standard this box is set at 1. In this case the exact amount of shares that is specified stays the same. If however the number is set at 5 the tool will automatically change the amount of shares to a multiple number of five. In this example the number of shares was initially calculated as 62 so the rounded number (multiple of five) would be 60. % Risk: this percentage represents the total percentage of risk one is willing to take with each single setup in relation to the total available risk capital. The exact percentage is different from one trader to another but is usually set from a minimum of 0,25% to 3.00% (max). In the example above the percentage is set at 1.00%. So if price is running against us after we get filled and our long position is stopped out, the total loss shall not be more than 1.00% (or $500) of our trading account ($50000). Commission: : the broker fee one has to pay in order to obtain the shares. It is strongly recommended to explore different brokers. Commission costs can (and will) be a very decisive element in profitability, especially for smaller trading accounts! % tax: the tax fee on the transaction (if applicable). In Belgium there is a tax fee of 0,27% (yeah, we know it… real criminals our politicians… on a transaction (buying and selling!) so that’s the percentage number we will use in that box. With the above information the Position Sizing Tool is ready to calculate some very specific money management elements that are extremely valuable in order to qualify our trading setup. Total Risk : this value represents the total amount of money that we lose if our initial stop-loss is hit. In the case of our ‘AAPL’long setup, the potential loss is limited to $497.82. Important: the total loss is also taking into account the commission and tax fees. Due to our %risk level that we’ve speficied in the fields above (1,00%) the total loss may not exceed $500 which is exactly 1,00% of our intial trading capital (50.000$). Risk Per Share: This is the difference between the buy and stopprice for one share. 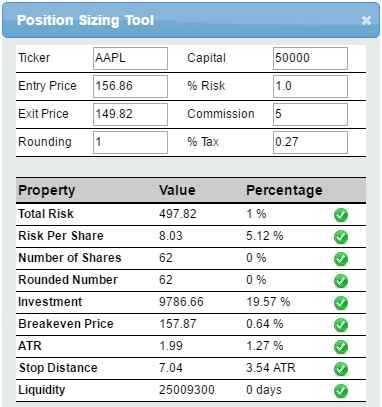 For our AAPL setup the risk per share would normally be $7.04 (buystop at 156.86 minus stoploss at 149.82). The reason that the result is higher in this example ($8.03) has to do with the fact that the risk per share is revalued by taking into account the commission and tax fees. Number of Shares : With the above information (total risk and risk per share) the number of shares we have to buy is automatically calculated by the tool. In the case of AAPL we have to put in a buystop order for 62 shares. Investment : This is the total amount of money we have to pay to obtain the number of shares calculated by the tool. Again, commission and tax fees included. In our example the total investment is $9786.66 or 19.57% of our total trading account ($50.000). Breakeven Price: This parameter is closely related to the broker commission and tax costs. Many traders tend to underestimate this kind of costs but this part of the position sizing tool clearly shows that we really have to keep an eye on it. In fact, the breakeven price tells us how much the stock has to rise before we can recover our broker and tax fees. In this setup AAPL has to gain 0.64% before we can get breakeven. Of course, the greater the investment the smaller our costpercentage becomes. ATR : This is the average true range of the stock on a daily base. It determines a stock’s volatility over a given period. That is, the tendency of a security to move, in either direction. The Position Sizing Tool uses a 22 day period to calculate the ATR. The value returned by the average true range is simply an indication as to how much a stock has moved either up or down on average over the defined period (22 days). High values indicate that prices are changing a large amount during the day. Low values indicate that prices are staying relatively constant. In our setup example, the ATR value is $1.99 which represents 1.27% of the stock price we are willing to pay ($156.86). Stop Distance:The stop distance is the difference between our entryprice and the stoplossprice. In this example the stop distance is $7.04 (entryprice minus stoplossprice). Next to the stop distance in absolute numbers, the stop is also calculated in ATR value. 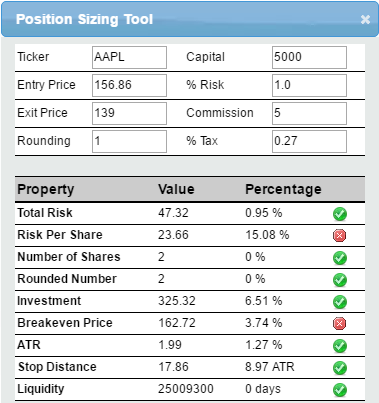 Since the ATR of AAPL Inc. is currently $1.99 it means that our stoploss has an ATR size of approximately 3.54 (7.04/1.99). Liquidity: This number shows the average volume over a period of 20 days. The percentage in the third column indicates how much days are needed to cover the number of shares we want to buy. Besides the fact that the position sizing tool gives us very valuable information about our future position it even goes further by interpreting those numbers and percentages! This way, almost every single item gets checked and earns a true of false status which is visualized by a green or red circle behind every line. In the example shown above we’ve changed a few things, our trading capital is reduced to $5000 and our stoploss is set at a much greater distance from the entry price ($149 in stead of $149.82). All other settings are the same. By changing just these two settings, the tool automatic changes the results in the lower white part of the tool. As we can see the Risk Per Share rises to 15.08% and the Breakeven Price also rises tot 3.74%. Those two items have now – instead of a green – a red circle. A green circle is ok, a red circle means that for that specific parameter attention is needed by the trader. In other words, a red circle is a clear warning that the setup can be too risky for the specified trading account. Total Risk: red circle if the total risk of the setup is greater than 2.50% of the trading account. Risk Per Share : red circle if the risk per share is greater than 15% of the share price. Number of Shares : red circle if the desired number of shares is more than 10% of the average daily volume (average over 20 days). Investment: red circle if the investment of the setup becomes more than 25% of the total trading capital. Breakeven Price: red circle if the breakeven price is more than 2,50% higher (lower in case of a short position) than the entry price. Stop Distance: red circle if the stop distance is less than two times the ATR value. Liquidity: red circle not applicable, the value and percentage are just informative. We are convinced that using this position sizing tool in addition to your own trading strategy will give you an edge in the market. Why? Because you will become more aware of the risk that is inherently involved in trading stocks and therefore your trading results will improve dramatically. So it’s up to you to take advantage of this tool and getting the hang out of it. Once you gained some experience in it you soon discover the benefits.